With a wedding in the near future it’s certainly an exciting time, but the planning process and the days leading up can be stressful to say the least. If that’s the case, you might want to spend some quality R&R time with your bridal party on Siesta Key before the big day – whether it’s a simple bridal party getaway or a fully planned bachelorette party. Our island is just the place for this type of mini-vacation with plenty of amazing spas, some of the most beautiful white sand beaches anywhere, and plenty of incredible restaurants, bars, and pubs to keep everyone happy – all within a convenient walking distance of the Tropical Breeze Resort. 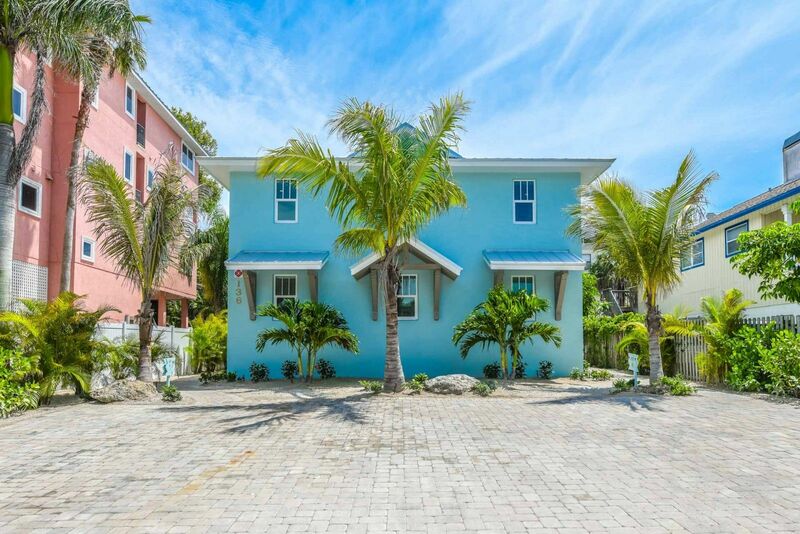 After checking into your luxury rental property, walk down to Siesta Key Beach. Photo credited to Christine Wozz Photography. For many, Siesta Key is all about the beaches. If that’s the case, you have very few reasons to ever leave Siesta Beach, especially when your time is limited. Siesta Beach is known for its glorious views, incredibly white sand, excellent facilities and laid-back atmosphere. The quartz sands float coolly between your toes even in the hottest sun. It’s the best spot on the island to enjoy pleasant and calm swimming in the gulf, nearby restaurants and a variety of amenities such as volleyball courts, lifeguard protection, concessions, restrooms, a picnic area and more. Look good and feel better — rejuvenation is an almost required part of your pre-wedding getaway experience. Plenty of luxurious spas can be found right in Siesta Village. Walk to dozens of local shops, boutiques, and cafes after spending the afternoon getting pampered at LaPlaya Spa, Hands of Light, Massage Experience Siesta Key, or Sassy Hair Salon. Your Bridal Party will love relaxing in one of these Siesta Key Spas and salons. LaPlaya Spa (5212 Ocean Blvd #3, Siesta Key, FL) offers a full spa menu with customized facials, dermaplaning, peels and other treatments, haircuts, color and highlights/lowlights, and a specific bridal hair and makeup package featuring up-dos, styling, designer makeup, false lashes and more. They also travel to you if required for a reasonable fee. Hands of Light (5255 Ocean Blvd) focuses on massage therapy where you can choose between a couples massage, deep tissue, Swedish, neuromuscular and aromatherapy massage. They’re sure to have the perfect massage to help you destress and relax. Massage Experience Siesta Key (5138 Ocean Blvd) is another top day spa for your group. It is a full adventure for brides and bridesmaids who want to undergo a full well-being transformation on the island. Choose from a variety of facials designed to give your skin an incredible new glow. A variety of massage modalities are available. Sassy Hair Salon (209 Beach Road) is the place to go to look your best for the wedding. They have a full nail, skin and hair care menu from waxing, to trial hair and makeup appointments, eyelashes, nail art, and bridal event hairstyles to test out before the wedding. The perfect follow up is to join your group on a private boat charter and immerse yourself in the Siesta Key sunset. Options include Siesta Key Watersports, LeBarge Tropical Cruises, and the Siesta Key Marina. Take your group over the waters at sunset, with hors d’oeuvres and wine/champagne in an unforgettable experience to cap off any night. If you need help booking, check out our Adventure Tiki where we partner with the best in the business to provide the best experiences for our guests. Want a bit of evening fun with the girls with a few 90s boy band dance songs playing in the background? Siesta Key is all about having a blast into the evening at the many restaurants and bars that stay open late in Siesta Village. The Daiquiri Deck (5250 Ocean Blvd) is open to 2 a.m. and has entertainment almost every night. The outdoor deck serves frozen daiquiris into the early morning. You and your entourage can also take over the dance floor at Gilligan’s Island Grill (5253 Ocean Blvd). Here you are surrounded by thick Florida foliage, elegantly covering the restaurant perimeter and roof. But really, it’s all about the tropical cocktails, satisfying eats, tiki-styled decor, and late-night DJ music, which you will find plenty of. Finally, if you manage to get the whole group up for brunch, wind your way down to the Village Café (5133 Ocean Blvd) for mimosas, bloody marys, and fresh omelets in a rustic and laid-back café. Afterward, walk around in Siesta Village to shop to your heart’s content, from swimwear boutiques to women’s apparel stores, jewelry makers, souvenir shops and more. Larger groups that want to stay together can book the Waikiki House and Maui House, both offering 3 bedrooms. Of course, you have to have a place to stay, and that is where we come in. Our luxury resort rooms are perfect for larger parties, or you can book a larger Siesta Key rental home that offers spacious accommodations and all the convenient amenities you could want for your bridal party – right in the heart of the island’s entertainment hub in Siesta Village. Hang out on the patio, dip in the pool, or walk to the beach day or night. We are your key to a big pre-wedding adventure with all your friends and family, soaking in the sights and the sounds of Siesta Key. Contact Tropical Breeze Resort for more things to do and places to stay for your bridal party at (941)-349-1125.